Need some help filling out your Zion itinerary for your upcoming trip to Springdale? We’ve got some fantastic recommendations for you. Springdale, UT – one of the most beautiful cities in the Western U.S. – is full of great places to visit, from restaurants to museums to shops and a whole lot more. Local business owners take great care in their operations which has helped create the unique and professional atmosphere that has come to characterize this famous small town. 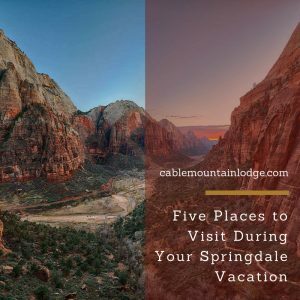 Here are 5 places that you just have to squeeze in to your Zion itinerary while vacationing in Springdale. Our first Zion itinerary recommendation: Zion Outfitter. This is the premier spot to rent and buy all the outdoor and adventure equipment that you would ever need inside Zion National Park. The folks who work here truly know their stuff, are friendly, and are eager to help their customers. They’ll provide you with all the appropriate gear according to the Park activities that you’ve got on your Zion itinerary. Hiking, biking, rock climbing, canyoneering, camping – you name it, they’ve got it, no matter your age or experience. And what’s even better is that they are located – literally – right next to the footbridge that leads directly to the booth at the Park’s entrance. It’s also a nice place to wait (if you find yourself being required to do so at some point) as they have chairs with generous misters overhead. camping gear, food, artwork, cutlery, novelty gifts, trinkets, toys, assorted rocks and stones, jewelry, games, books…you get the idea. You could spend a very long time in here just exploring all of the options. If you’re looking for something to bring home with you, or a gift for someone back home, this is where to get it. From Zion-branded souvenirs to brand-name outdoor clothing and everything in between, you and all the people in your party (including children) will love Toaquim’s Village. No Zion itinerary is complete without a visit (or two, or three) to Toaquim’s. Perks is a very popular espresso and smoothie joint with multiple locations throughout Southern Utah and most recently in Springdale. Located in the lobby of Cable Mountain Lodge, Perks at Zion is the perfect place to wake up. With famous espressos, smoothies, baked goods, additional food items, and many diet friendly choices, the menu choices and atmosphere can’t be beat. Perks is a very popular Zion itinerary item for Southern Utah travelers. The favorite restaurant of many frequent Zion National Park visitors, the Brew Pub maintains a wonderfully social yet polished environment that will make anyone feel comfortable as can be. Well- known for their handcrafted ales and seasonal drafts (from the Zion Canyon Brewing Company) in addition to a delicious upscale pub menu, hungry people of all ages and food preferences should have absolutely no problem having one of the best meals they’ve ever had at the Brew Pub. Your Zion itinerary needs to include at least one meal here. This may seem like a unusual item to include on a list of Zion itinerary recommendations, but the Happy Camper Market is just too essential to too many visitors that it bears mentioning. One of two supermarkets in Springdale, Happy Camper is the place to go when you want to cook a meal back at your suite or need to some trail-friendly snacks to carry with you into the Park. Fresh fruit, meats, dairy products, hot meals ready to go, dining accessories, canned and boxed goods, it’s all here. Zion itinerary tip: Make sure to put this place on your radar so you know where to go when the need for a supermarket presents itself.